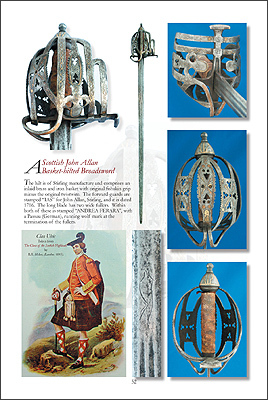 The Scottish basket hilt has become one of the most sought after swords for collectors. It is easy to understand why this is so. The shape and feel of an original highland broadsword is like no other sword. Add to this the inevitable myth and romance associated with such swords, and you will find an area of collecting where competition to acquire good examples is very high indeed. Before the introduction of the basket hilt, the Scottish highlander already carried at least three distinct sword types. The first was the claidheamh mor (claymore), or classic “big” sword. This was used from the 1500’s, and is of hand and a half length, with a long, broad blade. It has very recognisable quillons of diamond section, angled towards the blade. The terminus of the quillon is also decorated with brazed iron quatrefoils. In the late sixteenth and early seventeenth centuries, highlanders also carried the claidheamhda laimh or two handed sword. It is similar to German or Swiss two handed (Zweihander) swords carried by Landsknechte or mercenaries, and the few surviving examples have Scottish hilts with German blades. The hilt normally includes an oval shell guard and long, flattened, down-swept quillons. The third type of sword is referred to as the “Lowland Sword”. These have very long blades, with characteristic side rings to the hilt, globular pommels and quillons set at right angles to the blade, terminating in knobs. It must be remembered that it is a common mistake to refer to a Scottish basket hilt as a “claymore”. This is incorrect. They are two very different styles of sword. Having said this, Scottish commentators of the early 1600’s referred to the basket hilt as a “claymore”, but it is still best to differentiate. 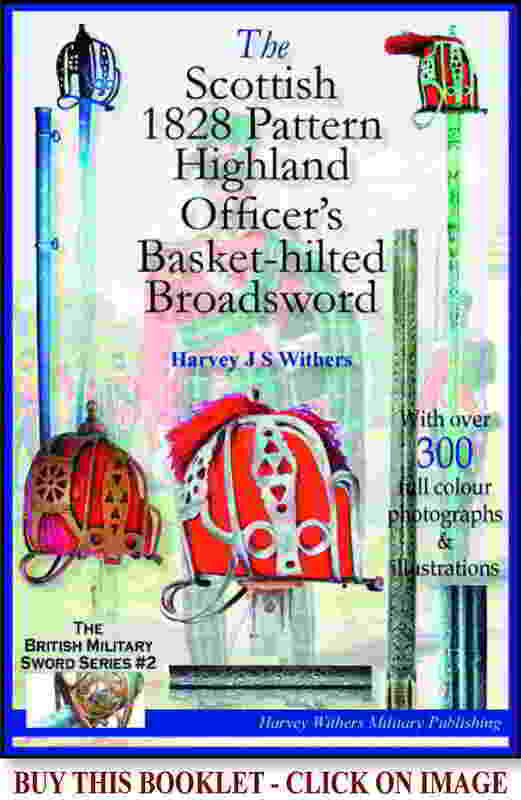 The geographical origin of this distinctly “Scottish” basket-hilted sword was not actually Scotland. Swords with basket hilts are likely to have originated in Germany, Scandanavia, and even England. Basket hilts of simple form were already known in England during the early 1500’s. The development of an enclosed hilt was a natural consequence of the need for more protection to the hand at a time when the wearing of armour, and particularly the metal gauntlet, had become less common. Why the sword became associated with highland use is not clear, although it is known that numbers of Scottish mercenaries fought for the English in Ireland during the sixteenth century, and it is probable that basket-hilted swords were brought back to Scotland and their design copied by local sword makers. They were then known as “Irish” hilts. There are very few visual sources to enable us to determine exactly when the basket hilt began to be carried in the Highlands. The earliest known painting showing a Scottish clansman carrying this type of sword, is recorded as being c.1680. The painting is of a “Highland Chieftain” by Michael Wright, and shows the subject carrying a broadsword with “beaknose” hilt. This comprised a series of welded ribbon-like strips of metal drawn together to form a beak at the front of the basket. The “beaknose” hilt was a specific Highland style and differed from English basket hilts in that the pommel was of “coned form” as opposed to the English “apple” shape. 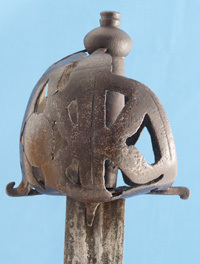 Pommel shape is an important indicator as to whether a basket hilt is either Scottish or English. In these early basket hilts of the 1600’s, there are some defining characteristics between the hilt styles of Scottish and English swords. The English hilt tended to have thinner, more spaced, bars, whereas Scottish hilts began to adopt wider, rectangular plates to either side of the hilt, coupled with decorative heart-shaped piercings. Problems of correct attribution do occur as we move into the eighteenth century and English swordmakers began to imitate the Scottish style. These swords were sold to the British Army, and carried by both infantry soldiers and horsemen. Ironically, there are many so-called “Scottish” basket hilts described as such within the collecting market, that were actually produced in such “Highland” areas as London and Birmingham! Where we do know of specific Highland makers, it is only because the maker has signed the hilt. These makers are normally categorised as falling into two schools of sword making; that of either the Stirling or Glasgow schools. They swords are universally acknowledged as being representative of the pinnacle of Scottish basket hilt sword making. The superb craftsmanship and detailing to the hilts marks them out as being of truly historic form. Father and son hilt-makers or “Hammermen”, John Allan Sr and Jnr (Stirling), and Walter Allan (Stirling), produced hilts of rare artistry, many with intricately inlaid brass circles, wavy lines and hatching. John Simpson of Glasgow was admitted as a Freeman of the Incorporation of Hammermen of Glasgow in 1711. His father was admitted in 1683 and became the King’s Armourer in Scotland. This family produced some very fine basket hilts. The wide variety and breadth of quality that we see in Scottish basket hilts indicates the likelihood that many were produced as part of a “cottage” industry. Most blades were imported from the continent, principally Germany, with the hilts then manufactured in Scotland. Back-street workshops in Glasgow, Stirling, Edinburgh and other locations, produced the swords with a workforce comprising little more than one or two persons. After the disaster of Culloden in 1746, the Scottish Highlander lost his right to bear arms, and the carrying of swords was outlawed. Most swords were not handed over to the English but hidden. The ban had a devastating effect on Scottish sword makers and the production of basket hilts went into decline. The subsequent raising of regiments for the British Army in Scotland initiated a requirement for basic military swords, but most of these were actually produced in England. They were still of basket hilt form. One of the most frequently encountered is the c.1750-1770 basket-hilted sword for privates in Highland regiments. It was of relatively poor manufacture, with a thin sheet metal guard and crude cut-outs in the junction plates. Grip was leather on wood. Blades were manufactured in London or Birmingham and are marked with a “GR”, crown, and maker’s name to either “Iefries” (Jeffries, London) or “Drury” (Birmingham). Most Scottish-made basket-hilted swords after 1746 are likely to have been made for officers in the newly formed Highland regiments. It is not surprising that demand far outstrips supply when it comes to sourcing original Scottish basket-hilted swords. As mentioned, many “Scottish” basket hilts are actually English in origin, and it is worth taking time to study the literature on this subject in order that the new collector purchases the correct piece. Prices are naturally very high for swords of the seventeenth and eighteenth centuries, and when a collection comes into the market via an auction house, estimates are frequently exceeded. Deep pockets are therefore a necessary evil. As with all early swords, care must be taken to avoid copies. They are limited in number but some are of high quality. If you are purchasing a basket hilt for the first time, it is probably wise to buy from either a reputable dealer or auction house. Not to be reproduced without prior agreement.